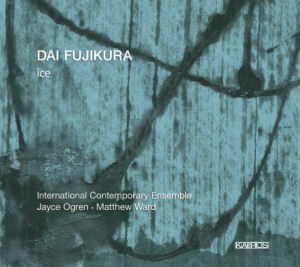 Dai Fujikura – Ice : Great or fake ? Rare reaction of my daughter when I get the opportunity to put contemporary music on the stereo: “it’s weird but it’s listenable…” This got me some warning… I publish articles on works that I found interesting or enjoyable – see here – I like very much this composer but found musical inspiration of this CD a bit low. Kairos told me that this CD encounters yet a real success in the USA and UK. 6 with electronic processing for more than 17′: the beginning offers of large flat electronic piece rather pleasant, but somewhat conventional. It varies a little from 4’40 with crystalline sounds on guitar, 7’30, the sound of the guitar becomes hoarse, in short a succession of dreamlike passages, with beautiful findings, but it tired a little. 4, despite all the virtuosity of the musicians (and with sounds as strange as with electronics, but more striking), is a bit talkative. 2: “Ice” which gives the title of the album: an instrumentarium “Neapolitan” (mandolins), a piece with a certain internal energy, but I’ve found a lot of redundancies, in short it is rather decorative even if you can appreciate the elegance and originality of the writing, in a kind of “zen” atmosphere that can please. 3: Cantilena succeed in a sophisticated orchestration, but nothing happens.